Who Holds The Most Successful Title Defenses Record? Since the 1940’s we’ve heard how heavyweight champion Joe “The Brown Bomber” Louis, 66-3 (52), held the most title defenses at 25. What you may have not read is there are two other boxers who have passed that record and are both at 27 defenses. Louis still holds the record for the most defenses in the same division. 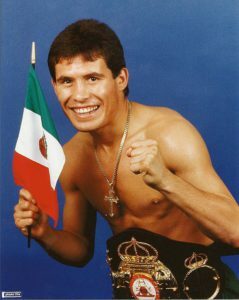 The first boxer to pass 25 defenses was none other than Mexico’s Julio Cesar “J.C.” Chavez, 107-6-2 (86). In September of 1984 Chavez won the vacant WBC World Super Featherweight title in his 44th fight improving his record to 43-0. He defeated Mexico’s Mario Martinez, 33-1-2, in the eighth round in L.A.
Chavez would make nine defenses of the WBC World Super Featherweight title before winning the WBA Lightweight title in November of 1987 stopping Puerto Rico’s Edwin Rosario, 31-2 in the eleventh round in Las Vegas. In a non-title bout in March of 1986 he improved his record to 50-0 knocking out Roberto Collins Lindo, of Costa Rica in Las Vegas. In his second defense he defeated WBC champion Jose Luis Ramirez, 101-6, of Mexico, by TD eleven rounds in a unification bout ahead 96-94, 95-93 and 98-91. He would give up the WBA title. In Chavez’s next fight he won the WBC Super Lightweight title from Roger Mayweather, 34-5, by RTD 10, in Inglewood, CA. It was their second meeting with the first for Mayweathers Lightweight title. In his third defense he added the IBF title in a unification bout win over Philadelphia’s Meldrick Taylor, 24-0-1, at 2:58 of the 12th and final round. Taylor took his eyes off of referee Richard Steele when he saw his trainer Lou Duva coming up the steps. Steel prematurely waved the fight off with just two seconds to go. Taylor was ahead 107-102 and 108-101 but behind 105-104. It was Ring Magazine’s “Fight of the Year!” Chavez improved to 69-0. It would be four and a half years before Taylor got his rematch. Chavez would defend both the WBC and IBF titles twice before giving up the IBF title. Five title fights later he would stop Greg Haugen, 32-4, in the fifth round in Mexico City before 132,247 in attendance in February of 1993. After another defense Chavez tried moving up and taking the WBC Welterweight title from Pernell “Sweet Pea” Whitaker, 32-1, that ended in a majority draw in September of 1993 in San Antonio, TX. Two fights later in January of 1994 Chavez lost his title to Frankie “The Surgeon” Randall, by split decision in Las Vegas. He was dropped for the first time in his career in the eleventh round and lost two points for low blows in rounds seven and eleven. Four months later in a rematch he re-won his title on a TD in eight. He was ahead 76-75 and 77-74 while behind 76-75. The next fight would be the “re-match” with Taylor, 32-3-1, in September of 1994 some four and a half years later in Las Vegas. Taylor then went onto win the WBA welterweight title two fights later. He would attempt to move up to super welterweight losing to WBC Champion Terry Norris. In his next fight he would lose his welterweight title to Venezuela’s Crisanto Espana fighting out of the UK. He would win his next three fights before meeting Chavez again losing in the eighth round behind on two cards and even on one. Chavez would improve to 91-1-1. In December Chavez made what would be his final successful defense against the former WBA World Lightweight Champion Tony “The Tiger” Lopez, 45-4-1, of Sacramento, CA, stopping him in the tenth in Monterrey, MEX. It was his twenty-seventh overall. He had nine at Super Featherweight, two at lightweight and sixteen at Super Welterweight. Four fights later, Chavez would lose his title to Oscar “Golden Boy” De La Hoya, 21-0, being stopped in the fourth round. After two defenses De La Hoya would move up to welterweight and defeat Whitaker. Three fights later Chavez would fight to a draw for his former WBC Super Lightweight title that ended in a draw against Miguel Angel Gonzalez, 42-1, in a vacant title bout. Chavez would try to win another title but lost in fights in De La Hoya and world champion Kostya Tszyu. The other boxer who also has made twenty-seven successful defenses is Omar Andres Narvez, 47-2-2 (25), from Chubat, Argentina. This southpaw is still active at age forty-two. His upcoming fight with southpaw South African Zolani Tete, 26-3 (21), of the UK, will be for his WBO World Bantamweight title on February 10th in the UK. Except for being held to a draw in his fifth and seventeenth fights Narvaez his record was spotless winning the WBO World Flyweight title when he was just 10-0-1. It was in July of 2002 winning a lopsided decision over Adonis “Caballo” Rivas, 17-2-1, of Nicaragua. In the fourth defense for Narvaez he was held to his second draw by Italy’s Andrea Sarritzu, 17-1-1, in Italy in a rematch. He was the WBO Inter-Continental Champion. This bout took place in December of 2002. In their previous battle Narvaez took a split decision win also in Italy. Sarritzu would eventually win the European title and lose in another world title fight effort. In March of 2007 Narvaez would defeat 2000 Olympic Gold Medalist Frenchman Brahim Asloum, 21-1, over twelve rounds. In February of 2009 he would stop American Rayonta “Stingray” Whitfield, 22-0, in the tenth round in Argentina. In May of 2010 he would win the vacant WBO World Super Flyweight title defeating Everth Briceno, 32-5-1, of Nicaragua. He had sixteen title defenses at Flyweight. After having three defenses Narvaez tried jumping up a division for Nonito Donaire’s, 26-1, WBC World Bantamweight title losing a lopsided decision in October of 2011 at Madison Square Garden’s WaMu Theater. He would return to his natural weight division and score eight more defenses reaching twenty-seven defenses. Narvaez was 43-1-2 when he lost in Japan to their Nayoya “Monster” Inoue, 7-0, being stopped in the second round in December of 2014. He would go onto win his last four bouts and is now getting ready for his bout with Tete.